Late-night host and comedian Jimmy Fallon has renewed his deal with NBC Entertainment, extending it six years and signing on through September 2021. 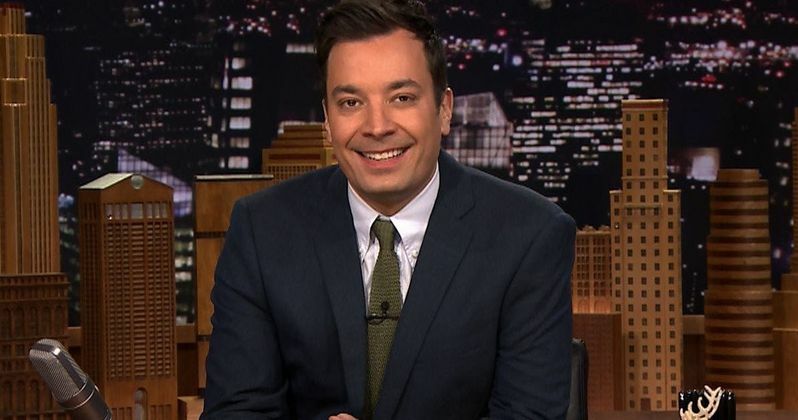 Since Jimmy Fallon took over as host in February 2014, The Tonight Show Starring Jimmy Fallon has dominated the late-night landscape versus all timeslot competition, winning in total viewers, the 18-49 demo and all other key ratings categories. The Tonight Show Starring Jimmy Fallon is America's #1 late-night talk show, averaging a 1.11 rating, 5 share in adults 18-49 and 3.8 million viewers overall for the 2014-15 season. Tonight dominates the time period over its ABC and CBS competition with a +79% margin of victory in adults 18-49. Here's what Steve Burke, Chief Executive Office, NBCUniversal, had to say about extending the talk show host's deal. "Jimmy has been an important member of the NBCUniversal family for 17 years. He is extraordinarily talented, hard-working and brings a level of creativity and energy every single day that is simply unmatched in television. The success of the The Tonight Show Starring Jimmy Fallon has been nothing short of remarkable. We couldn't be prouder of the show he and his team put on every night and couldn't be happier that he will remain with us at 30 Rock at least through 2021." From Universal Television and Broadway Video, The Tonight Show Starring Jimmy Fallon is executive produced by Lorne Michaels and produced by Josh Lieb. Gavin Purcell produces. The Tonight Show tapes before a live studio audience in New York's famed Rockefeller Center. Fallon is a three-time Emmy Award winner, twice as Outstanding Guest Actor in a Comedy Series for Saturday Night Live and one for Outstanding Creative Achievement in Interactive Media - Nonfiction for Late Night with Jimmy Fallon. Here's what Robert Greenblatt, Chairman, NBC Entertainment, had to say in his statement. "Jimmy Fallon is simply the best that there is, the most versatile star of a show anywhere in television in my opinion. The Tonight Show has always been an institution, but he's remade it into a destination for the largest audience anywhere in late night. He's the face of NBC in a lot of ways and we're thrilled he's going to be hosting The Tonight Show for many years to come." Fallon began his TV career with Saturday Night Live in 1998, where he quickly became an audience favorite. Known for his spot-on impressions, hilarious sketches and his stint with Tina Fey as co-anchor of Weekend Update, Fallon spent six successful years on the show. In March 2009, he returned to NBC and took over the Late Night legacy with Late Night with Jimmy Fallon, a show that consistently garnered attention for its viral videos, celebrity games and A-list guests. In May 2011, Fallon and the writers of Late Night released the New York Times best-seller "Thank You Notes," based on the popular show segment in which he addresses more than 150 subjects in need of his undying gratitude. "Thank You Notes 2," published in May 2012, hit the #1 spot on the New York Times best-seller list in its first week on sale. In June 2012, Warner Bros. Records released "Blow Your Pants Off," a musical comedy album featuring Fallon's collaborations with Paul McCartney, Bruce Springsteen, Dave Matthews, Justin Timberlake and more. The album debuted at No. 1 on Billboard's comedy album chart and won the 2013 Grammy for Best Comedy Album. Fallon's third book, "Your Baby's First Word Will Be Dada", children's book, was released in June 2015 and debuted at #1 on the New York Times bestseller list. Fallon received rave reviews for his stint hosting the 2010 Primetime Emmy Awards. Most notably, he opened the show with a star-studded performance of Bruce Springsteen's "Born to Run." Fallon and his wife, Nancy, live in New York City with their daughters, Winnie Rose and Frances Cole. Ruffalo Begs Fallon to Cut Avengers 4 Spoiler, Did He Drop the Title?